The BBC's Matthew Davis reports from the Olympic Games in "Challenges for disabled in Athens." My professional pride as a knowledge worker took it on the chin when I found out, only two days ago, that there is an ambitious conference on Travel and Disability scheduled for southern Brazil this year. 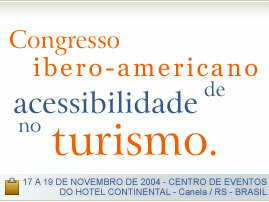 The Congresso Ibero-Americano de Acessibilidade no Turismo will take place at the Continental Hotel in Canela, Rio Grande do Sul, Brazil from November 17 to 19, 2004. Continue reading Inclusive Tourism Conference in Brazil. Como e que ouvi so hoje desse congresso maravilhoso em Rio Grande do Sul ? ?O Mercado de consumo para um Turismo sem barreiras? Continue reading Sou Pesquisador Nenhum!. ADA-compliant bathroom products now target the majority of your customers. Rather, they are targeting mainstream consumers of all ages with their ADA-compliant offerings and not even mentioning the fact that the products happen to meet the requirements of the Americans with Disabilities Act. The strategy is working ? so well that it may not be long before the majority of new-construction bathrooms are outfitted with ADA-compliant fixtures. While cruising the Inside Passage in Alaska I was able to attend part of Celebration 2004. The experience prompted an ongong conversation among some readers of The Rolling Rains Report. The question - What cultural values do Native Peoples have to offer the travel and hospitality industry with regard to universal design of products and services? The discussion is ongoing but I though the motto embedded in the banner found at Aboriginal Tourism British Columbia gets right to heart of the matter -- Who better to learn from than those who have been "in the business" of in-bound travel and "destination development" for thousands of years. By the time I got to Rasha's petition for accessible bathrooms on airplanes more than 10,000 people had signed already! Continue reading Rasha Kawar @ UCP. WASHINGTON, DC--Travelers with disabilities should notice improvements in accessibility at the nation's Motel 6 budget accommodations over the next 2 1/2 years under an agreement with the U.S. Department of Justice. The details of the agreement, which settles allegations that Motel 6 violated the 1990 Americans with Disabilities Act, were announced in a Justice Department statement released August 12. The statement did not include any details about specific allegations. Under the settlement, Motel 6 Operating L.P. agreed to bring its 600 motels into compliance with the ADA by December 31, 2006. The company will also hire a full-time ADA compliance officer, provide ADA training to all managers at its hotels, and hire an independent consultant to assess how Motel 6 complies with the agreement. If Motel 6 fails to "achieve substantial compliance" with the ADA in the time-frame of the agreement, it will have to pay $110,000 in civil penalties to the United States, the statement read. Motel 6 is owned by Accor SA, the world's fourth-largest hotel company. Accor North America, based in Dallas, Texas, operates Motel 6 along with hundreds of other hotels in the U.S. and Canada. Continue reading Motel 6 Meets the ADA. "Nine-year-old Fights For Accessibility Rights"
Rasha Kawar zoomed in from summer school with her pigtails bouncing. She wore a brightly colored outfit and carried a jelly purse adorned with a rhinestone letter "R."
I have come to greatly admire Foster Anderson, Founder of Shared Adventures in Santa Cruz, California and convener of the city?s annual Day on the Beach. My junior in age and years living with a disability, a list of his accomplishments make a sobering reality check for those who are older but may not have been wiser in focusing their time to the benefit of the world around them. Continue reading Foster Anderson @ Shared Adventures. Continue reading Follow-up on Ryan Air Suit. Several readers have found the approach of the UN's ICF to be very stimulating to their thought and work -- but requiring an investment of time to grasp. Continue reading International Classification of Functioning, Disability and Health. The Board organized an advisory committee to review the original guidelines and to recommend changes in order to get input from a cross section of stakeholders at the outset of the process. The ADAAG Review Advisory Committee, which included representation from the design and construction industry, the building code community, and people with disabilities, among others, submitted a report to the Board that detailed recommended revisions to the substance, organization, and format of the guidelines. The finalized guidelines are based largely on these recommendations. The Board published the guidelines in proposed form in November, 1999 and made them available for public comment for six months. The Board received over 2,500 public comments on its proposal and finalized the guidelines based on this input. Continue reading Answers to Common Questions About the New ADA-ABA Guidelines. "Mystery Shoppers" and "Travelers-on-Assignment" are two techniques currently being used within the disability community to evaluate the quality of inclusive travel services. Continue reading Inclusive Travel Mystery Shoppers?. Ring in the New Year from the deck of the Diamond Princess on a 10-night Mexican Riviera cruise that will cater to visually impaired passengers. The sailing, which is also for sighted passengers, will depart December 29th from Los Angeles and visit Cabo San Lucas, Acapulco, Zihuatanejo, Puerto Vallarta and Mazatlan before returning to Los Angeles. Among the amenities for those with sight impairments; Braille and large-print documents and menus, expedited check-in, assistance with forms, help in the dining room and buffet and assistance with guide dogs. Cost: From $1,700 per person, double occupancy (single surcharge $623), including meals and accommodations but not shore excursions, airfare or transfers. Contact: Sue Slater, Consultant for Accessible Cruises and Travel for Ticket To Travel, San Jose, (888) 726-9650 or (314) 726-6893. Continue reading Sue Slater @ Ticket to Travel in the L.A. Times. Continue reading Maysaa Bazna on Islam and Disability. Continue reading Adele Price Brings Air France to Court. In July, the U. S. Agency for International Development (USAID) announced a new policy to ensure access to construction projects it funds worldwide. USAID operates programs and services in over 100 countries to help improve economic growth, agriculture, trade, governance, education, and health. Some of these projects involve the construction or renovation of facilities. The new policy promotes universal design, which focuses on accommodating the broadest range of people, including those with disabilities, and recognizes available standards used in a host country. However, USAID will also require that the level access provided meet or exceed the one specified in the Board's new Americans with Disabilities Act (ADA) and Architectural Barriers Act (ABA) accessibility guidelines. Under this policy, the Board will serve as USAID's consultative partner in developing and maintaining accessibility requirements and providing technical assistance and training on accessibility criteria. Continue reading USAID Issues New Access Policy for Overseas Projects. Try the Universal Design tutorial online at the IDEA Center -- Designing Accessible Environments. Continue reading Online Course on Universal Design. Continue reading Anthony Tussler's New Paradigm of Disability Bibliography. Congratulations to Cheryl Gochnauer of the the Kansas City Star! She moves ahead the trend toward mainstream coverage of inclusive travel. "The cruise line required a letter from a doctor stating that they weren't a danger to themselves or others." ?The resources don't come cheap,? Ron said. ?It costs a disabled person more to travel, because there are a lot of things you have to think about: more luggage, more planning. You can't just throw yourself into one of these trips haphazardly.? Continue reading One Couple's Travels. This story on the adoption of Universal Design by the packaging industry is just another example of the impact of Boomer consumers. What is quietly occurring as "wrap rage" we are also seeing manifest as petitions , opinion pieces ( ) and lawsuits against airlines. The same occurs with hotels, taxis, restaurants, cruise lines -- anywhere that people go to live their lives. Spanning the terms of two governors, a model rennovation of the Governor's Mansion in Indianna incorporates Universal Design. For those who raise their eyebrows at the pricetag one could ask, "And how long would you put up with being barred from this -- and 49 other - governor's mansions?" If it had been built correctly in the first place this remodelling would have been uneccessary. Consider your future needs when you purchase your own home. The World of Universal Design is a site-in-progress designed to serve as a worldwide directory of organized centers of research, education and technical assistance on universal design around the world. The site is maintained by the IDEA Center / RERC on Universal Design at SUNY Buffalo. To stay up-to-date on Universal Design subscribe to The Global Universal Design Educator's Monthly Online News! Zaher A. A. Halleb has posted his dissertation entitled "An Explanatory Study of the Relationship Between Heathy Living and Travel Behavior." Continue reading Travel Behavior, Health and Personality.